Dissonance: Inharmonious or harsh sound; discord; cacophony. 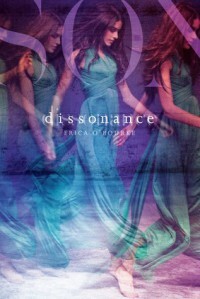 While not really a quote…I wondered, just exactly what the definition of dissonance was, so I looked it up and I have to say it's actually a suitable title for this series and the first book within it. Characters: 3.8/5 --I think this story overall could have done without the love triangle. It was unnecessary to me, but who knows, maybe it has a purpose yet to be disclosed. Flow: 4/5 --Told in a way that is actually not entirely inconceivable. Her terminology for the science behind the parallels is generally easily absorbed. Backdrop (World Building): 4/5 --Interesting concepts. Book Cover: 4/5 --Both covers are pretty, but I like the one with the girl barefoot in the dress, better. Mine was actually white with colored origami on it, which is pertinent to the book. Will I continue the series? I think so. Every time someone makes a choice, a new parallel world is spun off the existing one. Eating breakfast or skipping it, sneaking out instead of staying in bed—every decision creates an alternate universe in which an Echo self takes the road not travelled. As a Walker who can navigate between these realities, Del is training to help keep the dimensions in harmony. When Del secretly starts to investigate other dissonant worlds, she get tangled up with an Echo of her longtime crush. She knows she shouldn't keep seeing him. But as Del persists, she uncovers a truth that the Council of Walkers is trying to hide—a secret that threatens the entire multiverse. The front of the book says: Every action has consequences…even falling in love. This story is all about consequences, good ones, bad ones and everything in between. Every major decision creates a parallel world and every small decision creates branches from that. This makes the # of parallels infinite and that much more difficult to grasp. That can make the story difficult to grasp. With that being said I liked this more than I thought I would, based on the reviews I read. Ultimately I was able to grasp, maybe not fully, but it's a work in progress, so I think I would like to give it a shot…and see where it goes.